There’s nothing quite like the outdoor adventures that are created by children all throughout the summer. 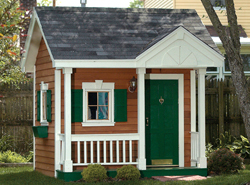 Building a children’s playhouse will provide just the backdrop for many fun and imaginative days for your children. Choose from several children's playhouse plans and soon your kids will be creating an outdoor world of their own designed especially for them. 192 Sq. Ft., Width 16'-0", Depth 16'-0"
217 Sq. Ft., Width 16'-0", Depth 16'-0"
64 Sq. Ft., Width 8'-0", Depth 8'-0"
Our collection of project plans includes many styles and sizes of children's playhouse plans perfect for your family's needs. We offer detailed blueprints that allow you to picture the finished project perfectly. With a wide variety of plans, we are sure that you will find the perfect do-it-yourself project to fit your needs and style.